Mired in a funding crunch, Big Brothers Big Sisters St. Catharines – Thorold & District (BBBS) were desperate to make up some lost funding. Funding cutbacks and a major drop in participation and donations through the Bowl for Kids Sake fundraiser – they were $75,000 short of their $200,000 goal for the 2013 event — put BBBS in an uneasy situation earlier this spring. If they didn’t make up some of the funding, it meant looking at cutting programs, and putting even more youth on a waiting list for service. 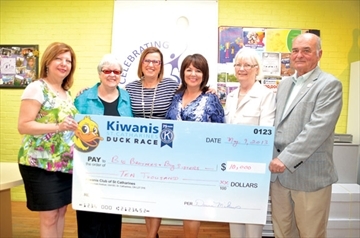 Cue the Kiwanis Club of St. Catharines, however, and there has been a “big boost” to the operations of BBBS. On May 15, the Kiwanis Clubpresented a donation of $30,000 to BBBS to help fund the after-school Not Just Homework Club. Currently the program is present in four elementary schools in St. Catharines, but the funds will be provided over a three-year period and will help the agency expand the program into more schools, and recruit volunteers to mentor children who attend. There is a demand for expansion from both Niagara school boards, and the funding will help the organization serve those kids in need of assistance. “This funding means everything for us,” said Frances Lettieri, director of services at BBBS. The youth, said Dominick, take away much more than simply homework assistance. The program, she said, helps build self esteem and self-confidence. It also promotes friendship with a volunteer who can provide fun and educational mentorship. Currently about 1,400 children are served through Big Brothers Big Sisters programs, but there are nearly 300 others on a waiting list. The funding from Kiwanis, as well as other donations from the community, assists the organization in reducing that wait list. The connection between BBBS and Kiwanis was made after the Kiwanis Club became aware of some of the financial challenges BBBS was facing. Club president Donna Mikus said the club is well aware of the great work BBBS does in the community, and they wanted to see how they could help. Kiwanis eventually heard from representatives from BBBS, including one of their youth who have benefitted from the program the organization offers, and the club’s major project committee felt it would be a valuable project to support.